Cricket or grasshopper? Bee or wasp? Accurate identification is the first and most important step in lawn and garden pest management. 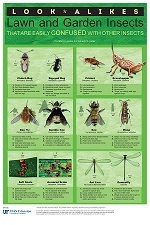 This colorful 12" x 18" poster helps you to identify common lawn and garden insects that are often mistaken for other insects.